Sometimes I am confident that I know a few things about babies, and sometimes I feel that I know nothing at all! But each one of my nine precious and exasperating little bundles has taught me something! Looking back I can see clearly what has worked and what hasn’t. Helping your baby sleep through the night is mostly about what you do during the day. Sleeping through the night is really, truly wonderful! It helps me to be a good mom. It helps my baby to be a content baby. Sleep allows me and my baby to recharge, dream, rest, heal, and grow. It is essential for a happy and healthy life! New babies have to eat every 2-3 hours around the clock and I am happy to oblige. But once I know that my baby can sleep through the night (around 8-13 weeks), I am all for it! I want to shift from survival mode to real life as soon as possible. There are some major schools of thought that drive what a mother does with her baby day in and day out. Demand feeding is when the baby is in charge. Scheduled feeding is when the clock is in charge. Parent directed feeding as when the parent is in charge. You would think that the parent would be more able to direct the feeding schedule than the baby or the clock, wouldn’t you? Yet the parent doesn’t always know what to do. Take me for example. When I first became a mother, I didn’t know what I was doing. God gave me the easiest baby in the history of babies. Areli was sweet, adorable, and LOVED TO SLEEP! I practiced a sort of demand feeding. Areli was sleeping through the night at 6 weeks. 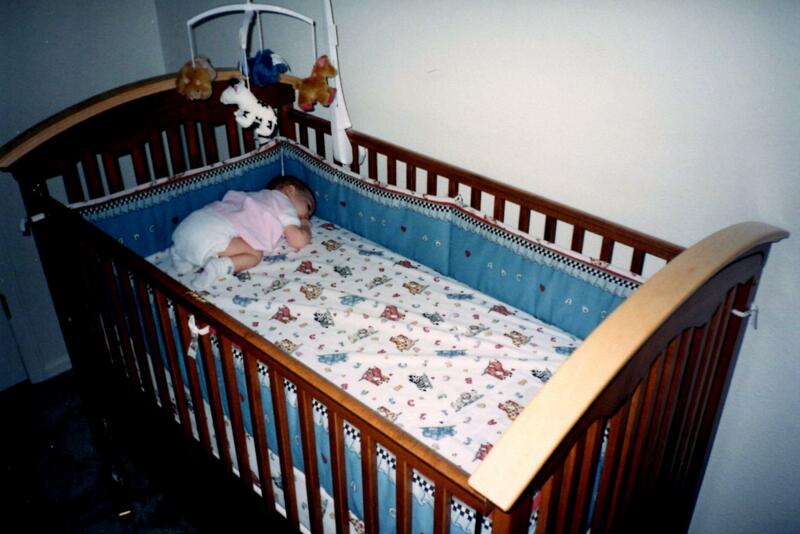 At two months she would sleep from 8pm to 8am without waking up. She was happy and content all day long. Yet she stopped gaining weight for two long months. I was so worried, and the doctor wanted to do all sorts of blood work on her. Finally I realized that the wisdom of “you never wake a sleeping baby” was absolutely false! Once I started waking her up at 10pm to give her an extra feeding, she started gaining weight again. Phew! My second baby was completely different! Cole was my first boy; loud, grumpy, and not a good sleeper. I would feed him whenever he seemed grumpy, which would usually be every hour and a half. I ended up nursing him before and after each nap, yet he often wasn’t content. I realized later that nursing my baby so often caused him to get into a bad habit of “snacking.” He would drink the foremilk but not get the richer hind milk that would have satisfied him for hours at a time. This little boy didn’t sleep through the night until he was over a year. We were not well rested or happy a lot of the time. My struggles with Cole led me to read On Becoming Babywise. I love this book! It gave me the knowledge to leave demand feeding behind and embark on the adventure of “parent directed feeding.” I will take it one step further than the book and suggest “Holy Spirit parent directed feeding.” No book or parent has all the answers, yet there is someone who ALWAYS does, and He gives wisdom to all who ask Him. I ask Him EVERY DAY for that wisdom. The seven babies that came next were all put on a “Babywise” type schedule, and they have all slept through the night between 8 and 13 weeks. Two have been girls, 5 have been boys, all have had unique personalities. Yet each of them have done very well with a predictable daytime schedule. The first few weeks of a baby’s life outside the womb is all about bonding and holding and getting one full feeding at a time. Don’t look at the clock. Don’t worry about sleep. (I know, easier said than done!) Just make sure every feeding is long enough (half an hour to an hour) to establish a good milk supply and create a good habit of drinking both the foremilk and the hind milk. The challenge here is keeping the little guy awake long enough to keep nursing! Start with 8 or more feedings a day. During the day you should feed your baby when she wakes up. Then try to get some awake time. As she gets older, wake time will become longer. 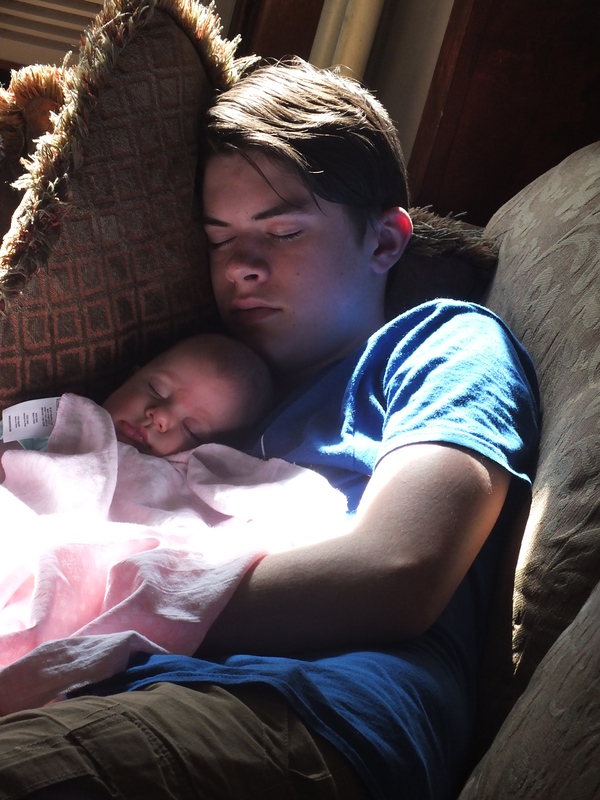 Once you know your baby is tired, put her down for a nap. Her naps should usually last and hour to an hour and a half. The end of the nap is the time for the next feeding and the beginning of a new cycle. Every cycle should be similar (2 ½ -3 hours long): eat, wake, sleep. During the night you simply feed your baby and put her back to bed. She will slowly extend her night time sleep until that glorious day when she drops the middle of the night feeding and sleeps until morning (usually around 8-13 weeks). The important part of this schedule is to feed your baby when she wakes from nighttime or naptime (or perhaps you will have to wake her to maintain every 3 hours during the day and every 4-5 hours a night at first). After the feeding, attempt to keep your baby awake for a little while. Newborns are so sleepy and this may not always work, but try. Soon she will be able to be awake for ½ hour to an hour at a time. When it is nap time, lay your baby in her bed while she is still awake. Usually she will fuss a little and then go to sleep. Some babies, like most of my boys, may cry very loudly! This is where the Holy Spirit comes in. Ask Him for wisdom. Sometimes it is appropriate to allow you baby to cry for a few minutes before nap time. The payoff is that in a few weeks, he will learn that nap time is for sleeping, and he will snuggle in and sleep as soon as you lay him down. Other times the crying indicates that he needs something extra: more awake time, a diaper change, or a snuggle. 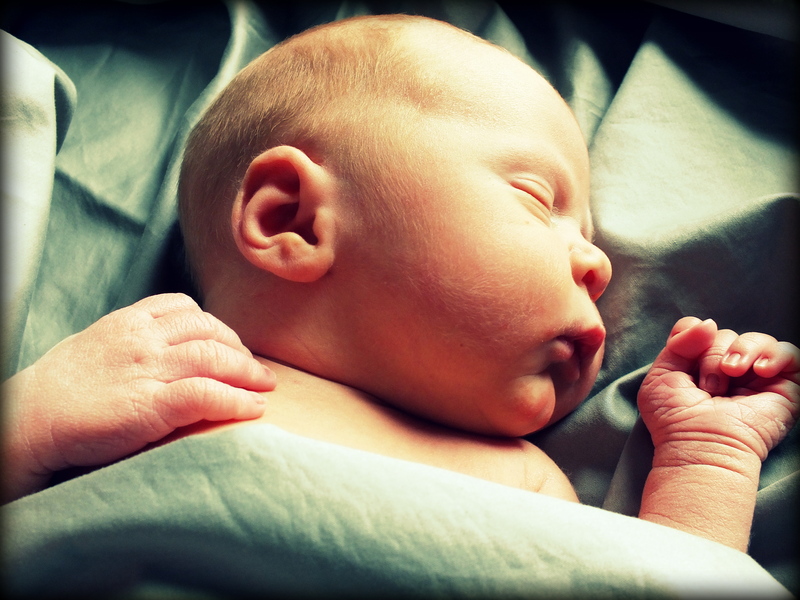 A baby can gradually extend his nighttime sleep to 9-10 hours. By the end of the 13th week, your baby can average 5-7 feedings a day but never less than four. Between weeks 12-15, most babies gradually extend their cycles to 3 to 4 hours. Your baby can sleep for 10-11 hours at night during this phase. Babywise states that during these weeks you will be able to drop the late night feeding and begin to introduce baby food during the day. There are many ideas about the best time to begin with food and which foods to introduce first. This is another time that I pay attention to my baby and ask the Holy Spirit. I prefer to look to traditional societies as a guide to introducing food to babies rather than to modern advice. Click here for more information on how to feed babies. I usually wait until 6-11 months to introduce solid foods. I also like to keep the late night feeding (around 10-11pm). My milk is the perfect food and it is always ready, so I am not in a hurry to start other foods with my babies. Plus I love nursing so much! I will include the Babywise recommendations for those who are introducing foods early than I do. During this time period your baby will maintain 4-6 liquid feedings in a 24 hour period, three of which will be supplemented with baby food(or not). Nurse first and then offer food. A baby can transition to three meals a day with the rest of the family by a year. Of course there are always snacks for young children, usually two a day (maybe afternoon and bedtime). 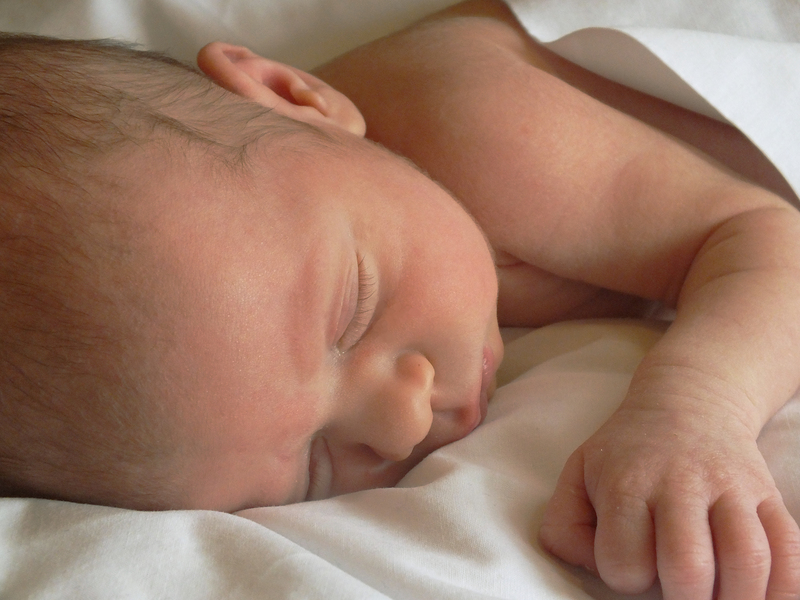 Babies at this age will only take two naps a day, 1 ½ to 2 ½ hours in length. They can still be nursing 4-5 times a day. I always try and nurse my babies as long as possible(12-18 months), but some of them had weaned themselves by this time. Others I slowly weaned because I was pregnant again. Sleep props are anything that your baby needs in order to fall asleep. The way you get your baby to fall asleep MOST of the time, will become your baby’s preferred routine. Don’t start a habit that you are not willing to continue indefinitely. Sleep props include nursing to sleep, rocking, music, pacifiers, sleeping in mom and dad’s bed, etc. If you start (after the first few weeks) to lay your baby down for a nap with no sleep props at all, he will learn to fall asleep on his own very quickly. I have found this to be invaluable! Imagine a busy day with a house full of children. When it is nap time, I simply carry my baby up to her bed, lay her belly down in her crib, speak some words of love, and walk out of the room. She immediately snuggles in, starts sucking on her fist and falls asleep! Sometimes there is an air conditioner or fan running, and sometimes there is not. The most important part is to lay her down when she is still awake MOST of the time. This will not happen all of the time, since newborns are so sleepy! If your newborn falls asleep in your arms or on your chest occasionally, don’t worry. Just enjoy the fleeting moment! Love and hold the little precious one, for they won’t be so little for very long! 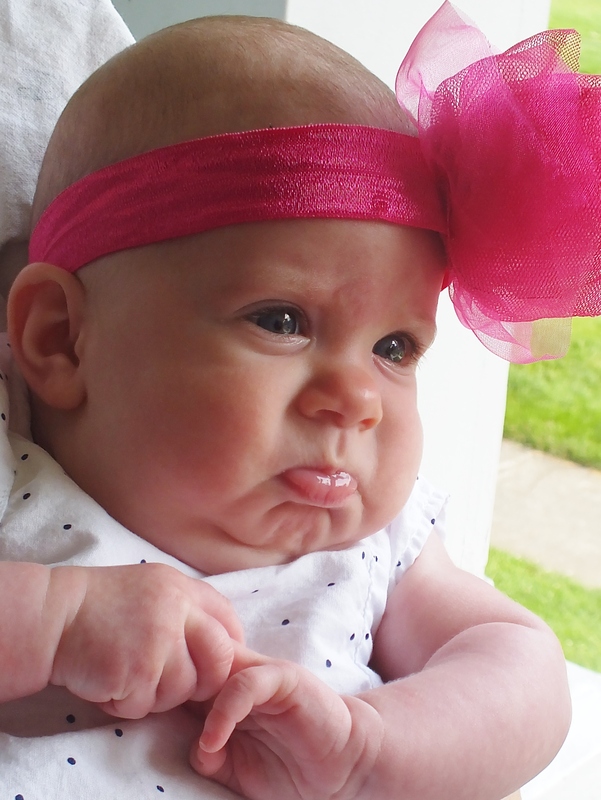 Some babies are fussier than others. Some are so colicky that it may seem like they never stop crying. This can be so emotionally and physically draining for parents. I just found a resource at the library that may help calm the difficult baby. There is a book and DVD called “The Happiest Baby on the Block.” It explains how to trigger the calming reflex in your newborn (up to three months) which can calm him in minutes! I wish I knew about this long ago! I haven’t gotten to try it out because my baby is now three and a half months old and is so happy. 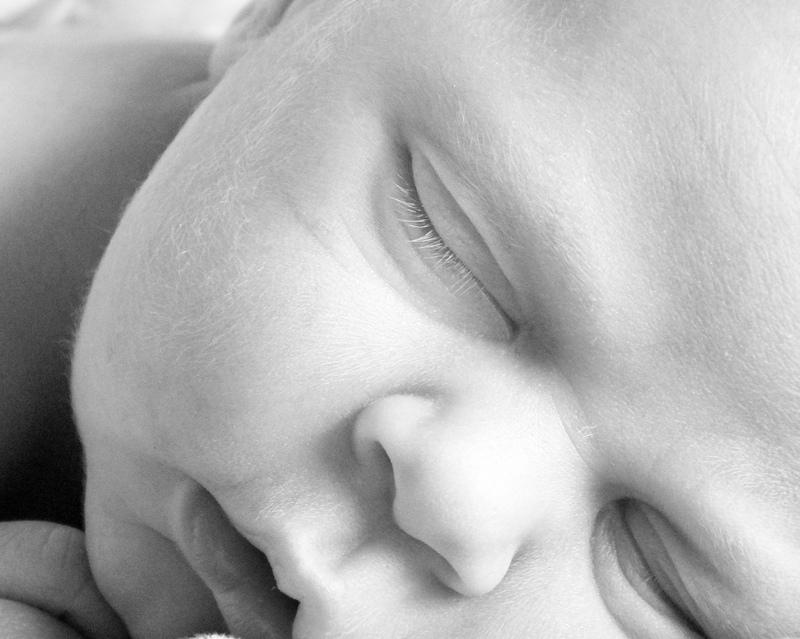 Some babies may have suffered some trauma while in the womb or during birth or after birth. This trauma can be greatly reduced or eliminated with chiropractic care, craniosacral fascial therapy(CFT), and prayer. To learn more about CFT click here. I took a class in CFT and it was wonderful. They are the happy baby people, and they say that every baby can be happy, peaceful, relaxed, and healthy. Some babies may have an allergy or sensitivity to something in mom’s milk, usually wheat or dairy. Eliminating those two things helps in many cases. All nursing moms (and everyone else for that matter) should eliminate all caffeine and stay away from sugar, processed foods and medication. For a diet for pregnant and nursing moms, click here. What if I didn’t start a Baby wise schedule when my baby was born but I want her to sleep through the night now? How do I start? Start by getting your baby on a good schedule during the day. Begin the eat, wake, sleep cycles and putting your baby to nap while she is still awake. It will take some time, maybe weeks, for your family to adjust to this. Don’t give up! Don’t worry about the nighttime just yet. Get the daytime straightened out first, and the nighttime usually follows. It is much more difficult to allow your baby to cry at night for fear of waking the rest of the family. Some crying before naptime during the day is much better. Think of it as practice for good nighttime sleeping. 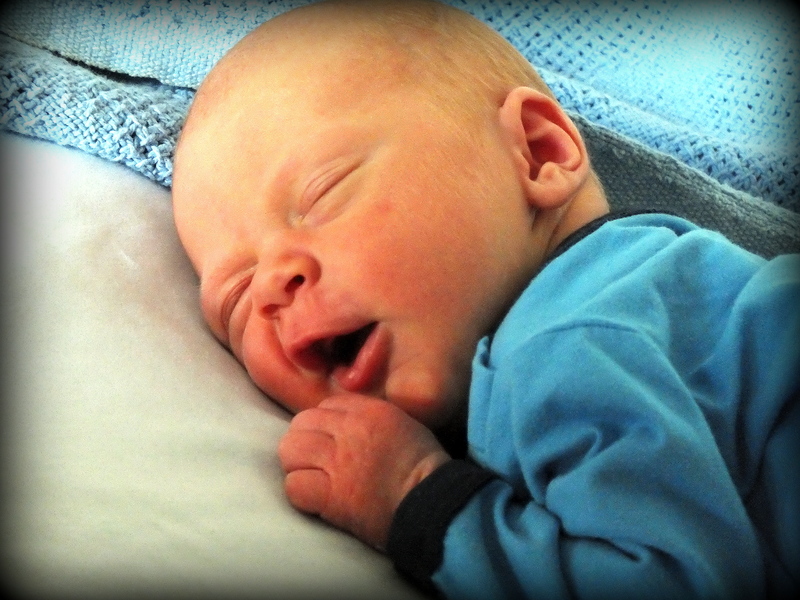 What if my Baby’s daytime routine has been great for weeks but he is still waking up at night? Move your baby into his own room or into a part of the house that is away from the other bedrooms. Sometimes that alone did the trick for me, because I wasn’t reacting to every little whimper I heard in the crib right next to me. Many times babies, just like the rest of us, will wake up at the end of a sleep cycle and get a little noisy or active until they fall asleep again. We don’t have to nurse them every time they stir. 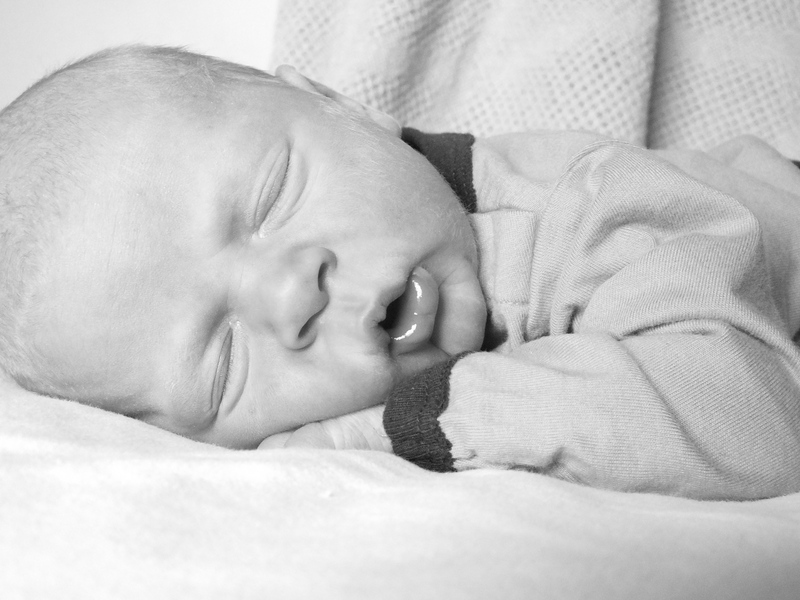 If you just can’t wait any longer for your baby to sleep through the night on his own, you know that he doesn’t need a feeding at night, and he is older than 13 weeks; then you can prepare yourself for a few nights of training. Pick a weekend when the family can sleep in the next few mornings in case you don’t get much sleep. Warn everyone beforehand that there may be some crying, and it is ok. If your baby wakes up, first wait to see if he will fall asleep in 5 minutes or so. If he doesn’t calm, then check on him, love him, whisper assuring words, but don’t nurse him. It would be awesome if Dad did this part! Hopefully after a few nights, baby will get the idea that nighttime is for sleeping and not for eating. Annalise is three and a half months old. She is a very easy baby, easier than most of my boys. Here is what my schedule looks like right now. 7:00 I talk to her, change her diaper, and then lay her in a pack-n-play so I can eat breakfast. 10:30 One of the other children holds her and talks to her. Then a diaper change and some belly time. Annalise sleeps so much that I usually have to wake her from nap. I like that because it gives me the flexibility to wake her a bit earlier or a bit later if I have to be somewhere at specific time during the day. All of my babies have had seasons when they started waking up at night after they had been sleeping the entire night through for some time. It could have been a growth spurt that required more milk, a bothersome stuffy nose, belly aches, or teething. Sometimes I would nurse them and sometimes I wouldn’t. Sometimes I would sit up with them and hold them, sometimes I wouldn’t. I would always ask the Holy Spirit for wisdom on how to comfort them and nourish them without starting a bad habit. Usually they would start sleeping through the night again soon on their own. I have spent nights trying in vain to comfort a fussy baby and have been utterly convinced that I wasn’t a very good mother. I have also had many happy days fueled by many peaceful nights. When my sweet, content baby giggles at me, I feel like a brilliant mother! I am neither a genius nor a failure in the mothering department. I am simply a normal mom who has a really great God! A God who loves my babies more than I do! If I can get my baby to sleep through the night, then you can too!